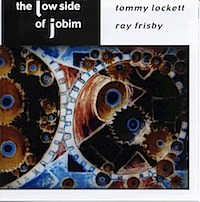 The Low Side of Jobim was recorded January 10-12 2001,at Heat Records Recording Studio,Woodland Hills, Ca. The album was produced, engineered and mixed by Tommy Lockett. Ray Frisbie is the percussionist, and an old friend from my days at Berklee. Ray is a very talented percussionist in all styles of music, and his sense of time and melody on this album really stands out.I always wanted to do just a bass album, and I always like jazz standards,so this album came from that concept. Jobim was perhaps one of the greatest composers on the 20th century, and his songs transcend all era's. Included are other composer's such as Steve Swallow, and Carla Bley, who are legends in my mind. The song "Falling Grace", was almost an anthem when I attended Berklee, and I always loved playing it.